(New York, N.Y.) – The revival of “The Golden Bride (Di Goldene Kale)” by the National Yiddish Theatre Folksbiene at the Museum of Jewish Heritage last month proved a number of things – not the least being that the National Yiddish Theatre Folksbiene is capable of mounting a Yiddish-language musical with Broadway-level talent and production values. I don’t know where they found these kids – and the vast majority of the cast at least seemed to be under 30 – but they did total justice to the rigorous demands of an unfamiliar musical style – Yiddish operetta – and in Yiddish itself no less. They also danced like the pros they obviously are, and to a live orchestra under the baton of Yiddish maestro and impresario Zalmen Mlotek. All this, and they captured the minds and hearts of their audience while garnering a rave review in the New York Times, no easy feat in itself. 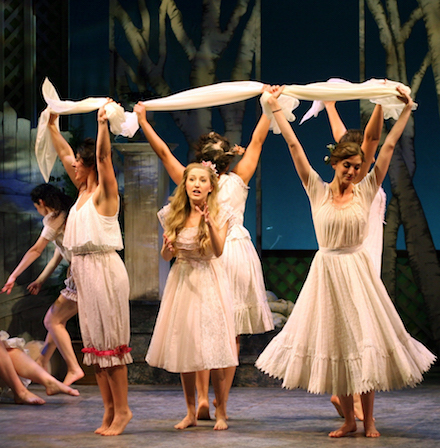 Sure, part of the magic may well be that Second Avenue pieces like Rumshinsky’s “The Golden Bride” were a significant influence on what would become the Broadway musical. Plenty of the composers of Broadway’s Golden Era grew up on this stuff, and it’s in the DNA of everything from “Fiddler on the Roof” (currently receiving its own stunning revival on Broadway) to “Hamilton.” All the basic elements are there in Rumshinsky’s piece from 1923, which is being given its first staging in New York (or perhaps anywhere) since 1948. And that’s a long time. But it was worth the wait, as the production – an outgrowth of a decade-long effort by musicologist Michael Ochs to put the missing puzzle pieces back together – reveled in the classic form that combines comedy, farce, romance, a mystery, and, of course, a wedding scene, delivered almost entirely in song and dance routines. 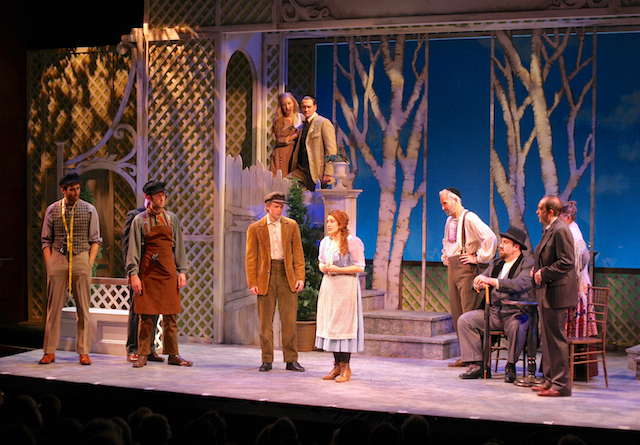 This immigrant-era operetta which takes immigration as its very subject – in particular, the wave of immigration from the Russian shtetl to New York City that came to an end just a year after the musical first opened – couldn’t have been more timely, either, as immigration has become a hot topic again not just here in the United States, but the world over. There are still so many debates about immigration – from Angela Merkel’s point that it often is and can now be a great economic booster for a nation, to the GOP’s Nuremburg-like policies for religious testing of immigrants and Donald Trump’s “send them back” policy on Mexicans and “don’t let them in to begin with” toward Muslims. While no great intellectual argument, “The Golden Bride” doesn’t paper over the complexity of the issue, with its acknowledgment of both the lure of American opportunity in the wake of Russian pogroms and Communist anti-Semitism and the inevitable losses that came from the breakup of centuries-old Jewish communities in Eastern Europe. Of course, history came down on the side of immigration to America, and the great burden of loss to come fell on the traditionalists who refused to leave their shtetls out of loyalty to their rebbes and fear of assimilation, which “The Golden Bride” addresses in astute fashion, slipping in its authors’ own hopes and fears between moments of frothy entertainment.